This New Moon calls attention once again to Capricorn, the pragmatic, ambitious, and authoritarian earth sign. There are six celestial bodies in Capricorn at the New Moon. Mars, Pluto, Sun, Moon, Mercury, and Jupiter are strung throughout the sign of the fish-tailed goat. Pluto and Mars are entering Capricorn, and Jupiter is exiting this month. Capricorn took center stage this past year. Astrologers anticipated Pluto’s ingress into Capricorn. We saw foundations and hierarchies teeter from seismic rumbling caused by Pluto. But the bringer of fair winds, the magnanimous Jupiter, also spent the last year in Capricorn. This month Jupiter ends its year-long transit through the sign. This past year, I noticed that Jupiter’s magnetism directed me to become more comfortable with my own Capricorn nature, even though I have no planets in that sign. Professionalism has been an important theme for me; accountability and survival another. After this lunar month, Capricorn energy will continue to be important due to Pluto’s ongoing transit but the themes will recede a bit. Jupiter moves forward into Aquarius on January 5th and we will be invited to embrace all things Aquarius for the next year. Endings and beginnings. If Capricorn is tethered to tradition and the past, Aquarius moves in the opposite direction toward innovation and the future. Janus, the god of January is shown facing opposite directions. He looks to the past and future. This month, to an even greater extent than usual for the beginning of a new year, we experience the dichotomy of backward and forward perspective. Janus is the god of gates and doorways. What door is opening for you? What door is closing? By nature are you more comfortable with Capricorn’s grounded earthiness or Aquarius’ airy intellectualism? We are making a shift between the two. These questions may provide insight. Twistings and turnings of note this month are Saturn’s retrograde station on New Year’s Eve and Mercury’s retrograde station on January 11 right after the Full Moon. I expect less frivolity on New Year’s due to Saturn’s station, but this energy does support making resolutions for the new year. Commitments made under Saturn take on more gravity. Keeping our resolutions realistic will create a better sense of accomplishment at the end of next year. Mercury’s retrograde brings all the usual: a chance to rethink or redo, experiences that invite us to use different ways of thinking, communicating, learning or processing information; and the unexpected. Since during this retrograde Mercury moves from Aquarius back to Capricorn and then forward again to Aquarius, Mercury becomes the messenger who bridges the past and the future. This retrograde period will be especially important in the chart for the Inauguration [see below]. The last time Mercury was retrograde at an Inauguration was in 1989. Perhaps that retrograde Mercury contributed to the failure of George H. Bush to attain a second term. The word “inauguration” derives from “augury:” to divine omens. At the moment the new president is sworn in, which occurs by law on January 20th at noon, we are able to divine what we can expect from this administration. Using divination, how may we help the outcome be for the greatest good? Here are some highlights of the Inauguration chart. 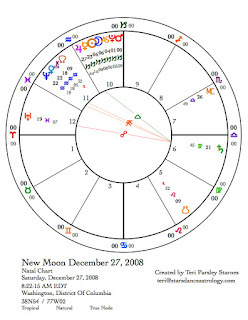 The Inauguration chart always has the same rising sign and the same house cusps since it must always occur at noon on January 20. Taurus always rises in these charts. Venus always rules the chart. In this chart, Venus is conjunct Uranus and opposing Saturn. See previous pieces on the qualities of the Uranus/Saturn opposition. Venus emphasizes that this opposition will be an ongoing and important dynamic in Obama’s administration. Venus invites conciliation. People who do not want to compromise during the next four years, who want either total revolution (Uranus) or complete conformity (Saturn) will be frustrated by Obama’s insistence on balancing between these two. However, I don’t think this means that we give up on making the sweeping changes that we believe in. Rather, we will be reminded over and over that simple polarization between good and bad, right and wrong, will not serve the changes we long for. Venus is in the idealistic sign of Pisces. Perhaps our ideals, empathy, readiness to surrender and sacrifice will guide us and the new president as we meet obstacles during the next four years. Mars in Capricorn is a grounded ally of Venus in this chart. This Mars also trines Saturn in Virgo, another earth sign. Pragmatism is an asset. In an Inauguration chart the Sun is always at 0° Aquarius Having every administration commence at the very beginning of Aquarius reveals much of our national mythos through Aquarian ideals: “We are the future. Our nation can meet all challenges through innovation, invention and technology. We stand for freedom.” The theme for this year’s inauguration is “Renewing America’s Promise.” Obama has come to stand for our Aquarian ideals. His rising sign is Aquarius and his Jupiter is located at 0° Aquarius. Jupiter is the planet of belief. “Yes, We Can” is a fantastic motto for Jupiter in Aquarius. The story of this inauguration gets more interesting when we consider that Mercury is retrograde and exactly conjunct to the Sun and Obama’s Jupiter. Mercury can be the Magician, easily manipulating a desired outcome or it can be the Trickster, twisting and turning meaning on its head. This energy is hard to predict. The message of hope may be hard to get out into the world or perhaps the message is everything. Perhaps we need messages of hope even more than we need plans for accomplishing what we hope for. If we just believe, can’t we do anything? 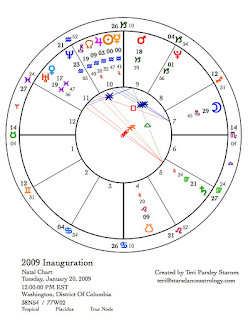 The Mercury/Jupiter theme of the Inauguration chart is repeated in Obama’s natal chart. Repeated themes in astrology, or any divination system, are important. In Obama's chart Jupiter is opposite Mercury. This opposition shows how he can often be a brilliant and inspiring speaker, but not always. Sometimes his communication style becomes weighed down and ponderous when he becomes too intellectual and too abstract. Will he be foiled by communication during his presidency or will it be his gift of magic? The Mercury retrograde in the Inauguration chart says communication will be key, it will be a challenge, and it will be unexpected. I suspect that Obama will need to use his powers of Piscean empathy to reach the world and inspire us to be the change that we long for. One of the most troubling things about the Inauguration chart is a void-of-course Moon. It would be nice if some astrology-savvy staff member (or perhaps Michelle consults astrologers?) would postpone the actual swearing in until the Moon goes into Sagittarius at 12:30 pm when it will no longer be in the void-of-course limbo land. But if we have to work with this late degree Scorpio Moon, the best way may be to use its energy to stop being naïve. Scorpio sees things the way they really are, warts and all. The Moon in these types of charts represents the mood of the people. Obama’s populace may not want to put up with the government operating in the same old way. With a void-of-course Moon, Obama may have a harder time connecting with the people. The Moon is also square to fantasy-producing Neptune. This energy contradicts the clear-eyed skepticism of Scorpio. Perhaps this connection to Neptune shows the portion of the people who believe, perhaps more than they should, that Obama will have all the answers and be the salvation for us all. Put to good use this Moon may help us be realistic while at the same time maintaining idealism. That balancing act is always a good trick. 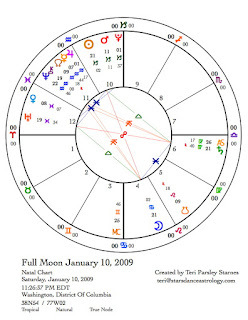 Right before the Inauguration, The Full Moon chart of January 10 emphasizes Neptune conjunct Chiron (themes of sacrifice and healing) as well as the opposition of Uranus and Saturn. The Sun and Moon, are allies of Uranus and Saturn at this time. Breakthroughs in stalemates may happen in the period leading up to the Full Moon or right after. Have you noticed oppositions to what you believe or desire in the last month or so? Perhaps the opposition comes from a more conservative, Saturn-type person or situation. Or perhaps the opposition comes from a more revolutionary or extreme person or situation. At the Full Moon, seek inspiration or resolution for any oppositions you have encountered. What are you learning? If you have any personal planets or points are within 18° to 22° of Cardinal* or Mutable** signs, then you may feel this Full Moon even more strongly. Standing at the doorway between the old year and the next what do you see? What calls to you? How will you support that vision into the future? It will be a good thing to remember what we have learned from Capricorn as we move forward into Aquarius. Thank you for the most interesting entry on Capricorn New Moon. I have a few personal planets and stars/points in the 18 to 22 deg range. Venus in Libra, Part of Fortune in Gemini, Pallas in Sagi natally and Jupiter in Capri, Uranus in Pisces, Pallas in Gemini, Saturn in Virgo in my Solar Return. Couls you point to me the right direction for figuring out how i will feel the energy strongly. Dipika, I recommend that you focus on transits to your natal chart rather than your solar return chart. You ask a great philosophical question, though I think a word may have been left out: How do we integrate so much information forget the actual learning? I strive to simplify astrological information that I pay attention to. For me, astrology is a practice in mindfulness, how much do I pay attention to and what do I let go of? I rely on my own intuition and self-awareness to answer that question. I invite you to use astrology in the same way. When a transit occurs, simply notice what is going on within and around you. What are you learning?